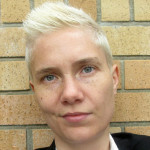 Anna Wärje’s work has appeared in various literary magazines including Room, Event, CV2, Descant, and The Dalhousie Review, as well as in Rocksalt: An Anthology of Contemporary BC Poetry (Mother Tongue Publishing Ltd.) and Cleavage: Breakaway Fiction for Real Girls (Sumach Press). Anna is the recipient of a Canada Council for the Arts Emerging Writer's Grant and has published one collection of poetry, On Lost Roads (Country Light Publishing). Anna lives on Salt Spring Island.